Pizza Shots are coming your way for Friday pizza night! 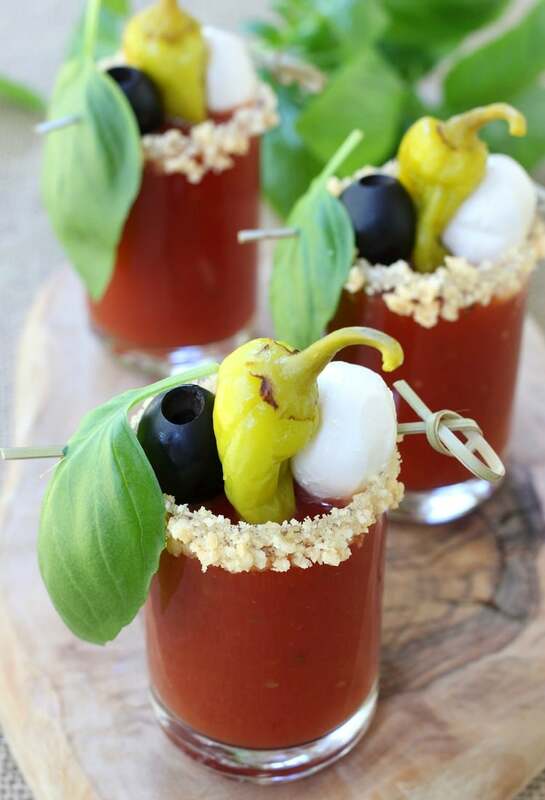 If you like a bloody mary, you’re going to love these! I seem to have tomato on my mind this week. 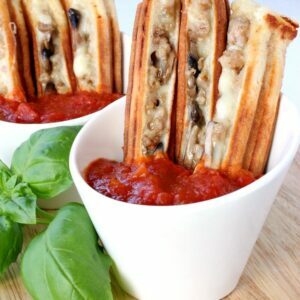 First it was the Homemade Marinara Sauce, then we made these Eggplant Parmesan Toasts…now it’s time for cocktails. Friday night was always pizza night in my house growing up. We all used to get so excited at the idea of that pizza coming to the house – my dad picked it up – we could never wait for delivery. We wanted it as soon as possible. Now we order pizza a lot less frequently. 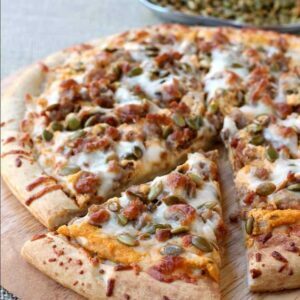 I actually think we might need to bring bak the whole Friday night pizza tradition because with all the food we make on a daily basis we get pizza maybe once a month. 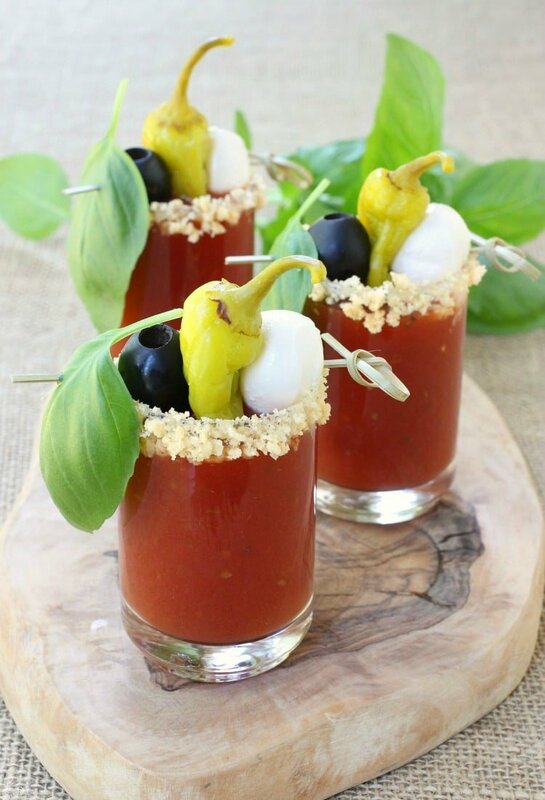 Pizza Shots are a tomato juice base cocktail but really that’s the only similarity here to a Bloody Mary. There’s no celery salt or worcestershire sauce. No hot sauce either. SO after a few hours you have this totally amazing flavored tomato juice that you’re going to use as the base for your shooters. All that’s left to add is the booze. Vodka here, and a lot of it. I’m doing about a 50/50 ratio of juice to vodka – these are shots after all. You can take it, I promise. 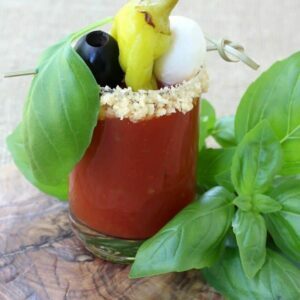 Once you mix those together it’s time for the garnish. I grabbed black olives, fresh mozzarella balls and then the peppers and fresh basil. Now for the best part…the parmesan cheese crisp rim. Do NOT, I repeat do NOT skip the rim here. The cheese crisps are what make this Pizza Shot actually taste like pizza. It’s pretty amazing once you try it. You can find these parmesan crisps in the deli section of your grocery store. Now take a look at that. It’s like an appetizer and a cocktail all in one! 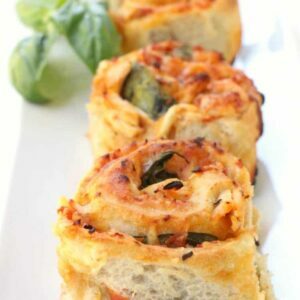 The only thing that makes these Pizza Shots even better is if you’re actually having a pizza for dinner too. 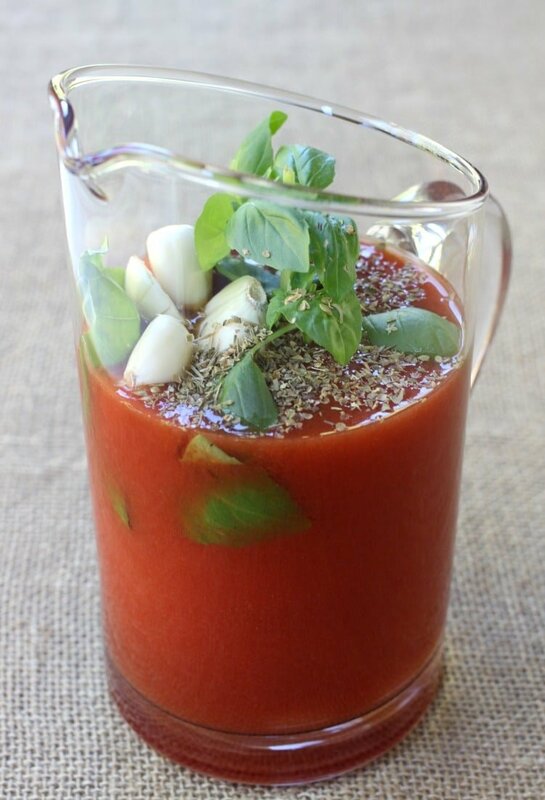 In a pitcher, combine the tomato juice, vodka, pepper brine, orgegao and garlic cloves. Stir and let sit in the refrigerator for at least 2 hours or up to overnight. Rim the glasses by dipping the rims in corn syrup (Or you can use olive oil but I think the corn syrup sticks better) and then the crushed parmesan crisps. Divide the tomato juice mixture evenly between the shot glasses. 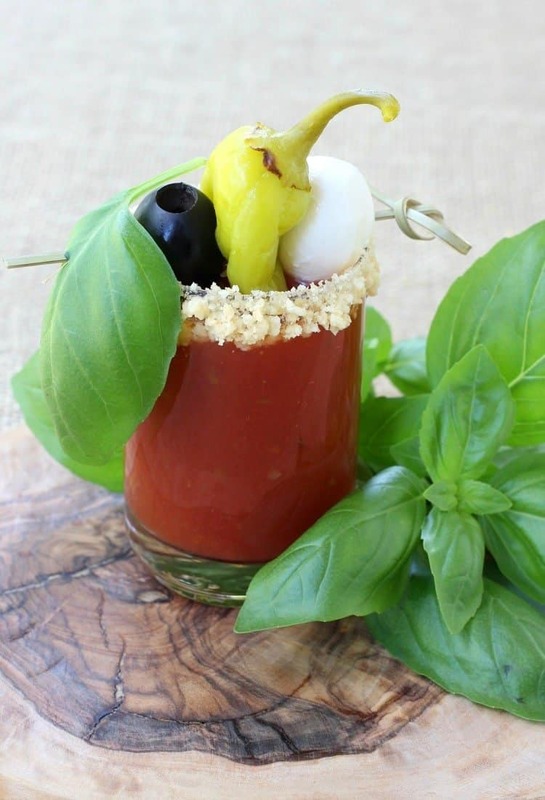 Assemble the garnish on tooth picks and lay across each glass. This recipe was adapted from the Food Network Magazine.